Though they weren’t the first company to license their characters to Art Asylum’s Minimates line, Marvel Comics was the first major comic book company to support AA, starting back in 2003. One year (and 6 waves) later, DC Comics decided to get into the game as well. Since they didn’t want their products to get lost in the shuffle, they decided to up the ante and do one better than Marvel, and so their deal with Art Asylum saw the introduction of the C3 concept (which stands for “Create, Construct, Customize“). C3 brought Minimates one step closer to Legos, since the whole idea behind the concept was that Minimates were no longer just figures, but now they were figures that came with building block sets that were “compatible with other popular building block systems”. It was a viable marketing idea, but the problem is that Minimates were never intended to be compatible with (or compared to) Legos. As a result of this move to introduce building blocks to accompany the figures, the battle that Art Asylum had been fighting to not have their products looked at as just another “Lego knock off” took a major hit. The real unfortunate thing about this concept wasn’t the quality of the product, but rather it’s execution. Mega Blox has become a formidable competitor to Legos, if only because they have been around long enough to make a name for themselves and acquire decent licenses. C3, however, only lasted for 2 short waves, which effectively killed any chances of people taking it seriously. 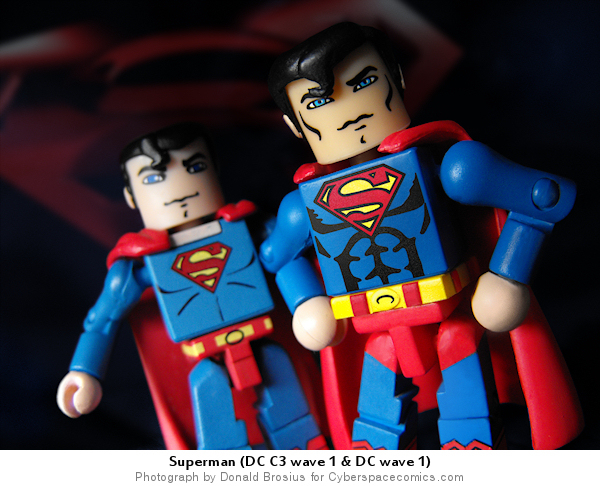 Still, in those 2 waves, we were given many well known (and well designed) DC characters in Minimate form. But DC wasn’t done with the Minimate scene after C3 went under. In 2007, they signed another contract with Art Asylum, and with this new deal, they took a different approach. The C3 line was based off of the success of the Bruce Timm helmed Justice League cartoon series, and so all of the initial DC Minimates were designed from the cartoon. For DC’s second Minimate venture, they tried appealing to a less mainstream market, with all of their designs being focused on the more serious look of the comic books. This was pretty straight forward. I photographed the two Minimates standing next to each other against an unlit black background, and then superimposed the red “S” symbol behind them via photoshop. I really don’t see much difference between the two figures besides some minor cosmetic differences here and there. Does one do something that the other doesn’t? The aesthetics are the only notable differences. Minimates generally don’t have gimmicks, so you won’t see any kind of light up action or anything along those lines. The reason I chose this character wasn’t so much to compare the differences between those two releases, but rather to set up for the history behind the DC lines. It will make more sense in following weeks, when I delve into it a little deeper with various other characters. Sweet! Using magnets was a pretty clever idea. About the differences in the Superman Minimates – it’s like I said in the third paragraph; all of the C3 ‘mates were designed based off of Brue Timm’s Justice League animated series. When C3 folded and DC came back 4 years later with a new contract for AA, they dropped the cartoon approach and went for a comic-centric theme to all their releases. The reason you don’t see much difference between these two is that Superman has basically the same look in the cartoon that he has in the comic (thanks to Bruce Timm, who didn’t pull an X-Men Evolution move and change all the characters and costumes). When I start showcasing some of the Batman releases, you’ll really see how the differences become evident. heh. 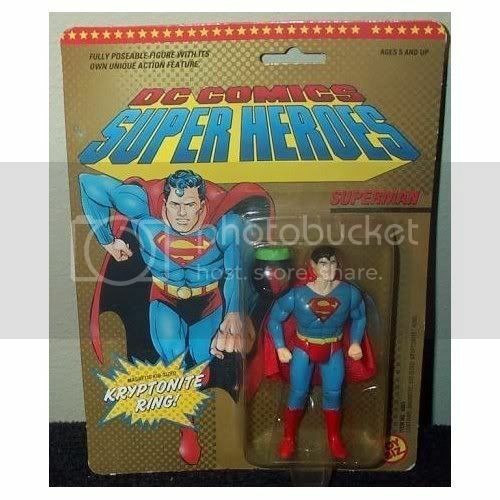 apparently the “real” Superman has more muscles than the cartoon version.